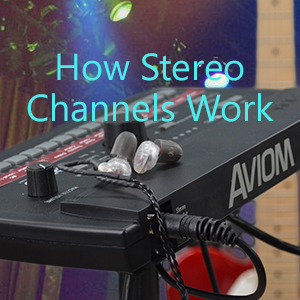 The A360 and A320 Personal Mixers support 16 stereo mix buttons (that’s 32 channels in all). 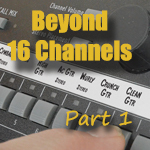 When connecting and configuring inputs, it’s important to understand how the inputs get mapped to the mix channel buttons. It’s easiest to view each input device as having stereo input pairs (channels 1-2, 3-4, 5-6, etc.). The odd numbered channel feeds the left side of a stereo channel; the even number feeds the right side. As with most other devices that support mono/stereo input channels, if you don’t need a stereo input for a particular channel, plug the source into the left (mono) input and ignore the right side, leaving it unused. In real-world situations, most personal mixing systems will use a mixture of mono and stereo sources. When channels are stereo linked, the channels act as a stereo pair, occupying one mix channel button on the A360/A320. The example table below shows the mapping of 32 input sources to an A320’s channel buttons. This is equivalent to the A360’s Default mode. 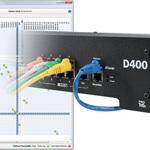 (Note that the analog AN-16/i v.2 Input Module is used for the example, but any valid combination of input devices, including a Dante network, can be used). If the channels are not stereo linked, then only the odd (left) input channel is utilized by the Personal Mixer, and the even (right) input channel is ignored even if you connect an audio source to that input. Note that this mapping applies to the A360 Personal Mixer as well, but the A360 can support even more sources (up to 64) and it also has the two special channels, Dual Profile Channel and Ambience, that can also support stereo audio from the network. The A360 can also take advantage of custom channel mapping by using the A360 Channel Manager software. We’ve created a simple input list spreadsheet that you can use to keep track of the mono/stereo input sources in your audio system. Download it for free.